Today the DEE-lightful Dee is with us sharing how to convert your zip into a double zip. My newest pattern is all the better for a double zip, but being very aware of how difficult it can be to get hold of double zips, the lovely Dee took photos along the way to share with you all. Two zips with same size teeth and Slider, with at least one of them a bit longer than the desired finished zip size. Or one zip a little longer than the desired size + a second identical Slider. a friend or a third hand (the friend is easier to find) Or good hand/eye coordination to do it on your own. 1. Decide whether you want the sliders to face toward each other or away. It will make a big difference to the action of the zip. My zip has the sliders facing each other so that I can open my bag from the centre top. From here on I am going to describe the process for making the two sliders close by pulling towards each other. 2. Using the small pliers carefully remove the top stops on the long zip. It is important that you don’t damage the zip tape or the teeth. 3. Repeat step 2 for the second zip so the slider of that zip can be removed. If you want to recycle the left over zip tape and teeth of the second zip, undo the zip all the way and slip the slider off the bottom while the zip is fully open - that will give you some funky zip trim to use n another project. 4. Take the second slider to add it to the zip that will become you new-improved-double-slider zip. Put the second slider on one side of the tape over one or two teeth. I found it helps if the zip is sitting flat on the lap of person who is helping you with the 'business' end closest to your assistant. Get your helper to put a finger on the tape so the slider doesn't move and carefully ease the other part of the zip tape into the slider. Try to get the zip tape roughly even. It doesn't matter if the tape is one tooth different, but more than a small amount different will cause the sliders to mismatch as the zip closes. 5. Once you have the very ends of the zip tape in the tip of the slider you will feel a little resistance. This is where you need to either be a three-handed wonder-beast or have an assistant (if taking photos, you may like to ask your assistant to remove the old nail polish or, like me, just say "Nah, she'll be right mate" in the Aussie tradition). 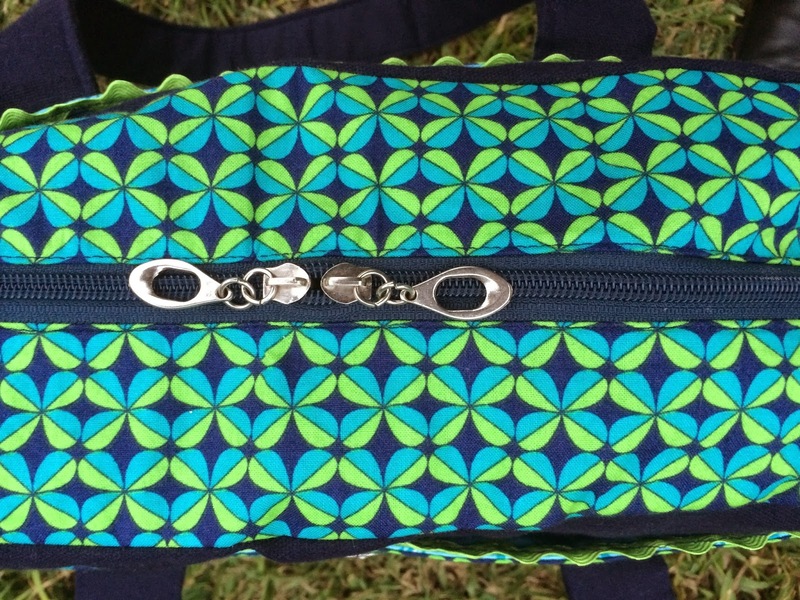 AND wiggle and pull on the slider / zipper pull. This is the trickiest part of the whole process and may need several attempts. If you get it on the first go - yeay you! Once the slider starts to run along the teeth you have done it... well almost done it. Move the two sliders together and see how well they line up. The two sliders meet evenly, nose-to-nose and we can skip off into the sunset having mastered (or fluked) the two-slider zip technique. Can you see the difference between this picture and the one above it? There is a slight bulge in the side of the zip tape in this second image. This is caused by the teeth being out of synch at the beginning by more than one tooth. The solution is simple; take the slider off and try again. You will get it there in the end. When the slider is on properly you can see the teeth interlock one after another. As you can see here, the tape isn't quite even but the teeth do merge one from each side. You may also notice that after a few goes the outermost teeth are starting to look a bit damaged. They have been stressed by first having the stop removed and then the pressure of getting the slider back on - this is why it is a good idea to start with a zip slightly longer than you need. That's it - you're done! Now you can use your zip. 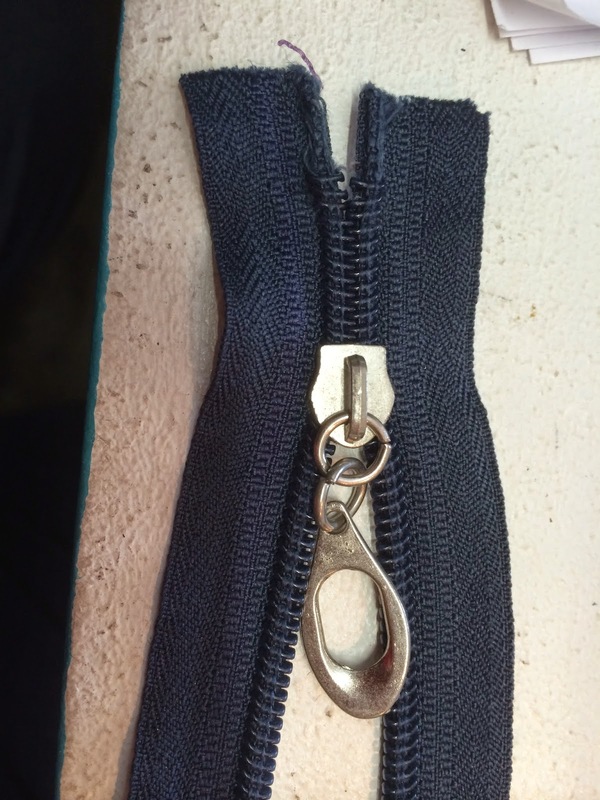 The technique for converting the zip to a double slider is the same regardless of which way your slider faces; instead of starting at the top of the zip, you would start at the bottom of the zip and put the slide on the the widest part - flat end - going first. So now when you want that bag to have a zip meet in the middle and you don't have a zip with two sliders and the nearest specialty store is electronic and you just can't bear to wait 10+ days for that sucker to get here from the other side of the planet... You can raid you stash and as long as you have at least one zip in the right colour and a second with the same size teeth, you can fix that little problem in five minutes flat and be on you merry way to installing your lovely new double-slider zip. It can be fun to use different coloured or mismatching pulls and sliders - but I don't have any picture of those.